This page shows the latest ApotheCom news and features for those working in and with pharma, biotech and healthcare. Prior to Euro RSCG Life, Barratt was MD of Lowe Azure and Lowe Fusion, and MD of ApotheCom Europe. Julia Holt is client services director at ApotheCom. Paragamian has held a number of senior leadership roles for industry and agency companies, including Johnson &Johnson and Roche, most recently having served as president of ApotheCom. During his career, Barratt has been managing director of Apothecom Europe, managing director of Lowe Healthcare Europe, CEO of Euro RSCG Life London and director of Healthcare Communications Consultancy. Kane &Finkel has brought in ApotheCom ScopeMedical's John Flaherty to take on the role of European director. Cally joins from Apothecom Scopemedical where she was Director of Client Services overseeing a number of global, EMEA and UK full-service medical communications accounts. 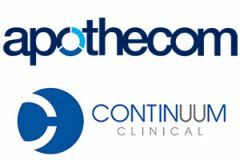 ApotheCom ScopeMedical is a leading provider of medical education and marketing services to the pharmaceutical industry. ... ApotheCom ScopeMedical Ltd.